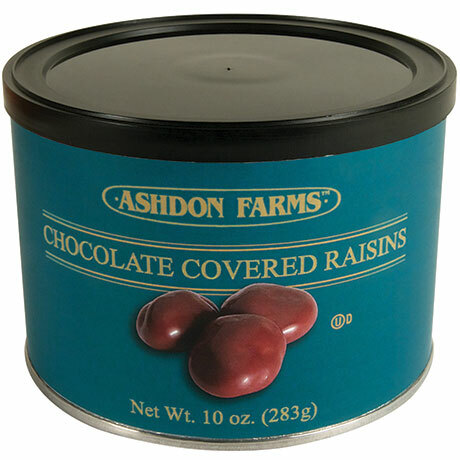 Juicy, sweet raisins covered with a layer of creamy milk chocolate. Pull-top can with resealable lid. 10 ounces. Please note: Shipping may be delayed until temperatures drop below 80 degrees. Confectionery coating (sugar, hydrogenated palm kernel oil, cocoa powder, whey powder, nonfat milk powder, soy lecithin [an emulsifier], vanilla), raisins, milk chocolate (sugar, cocoa butter, chocolate liquor, whole milk powder, soy lecithin [an emulsifier], salt, vanilla), carnauba wax, gum acacia, corn syrup.